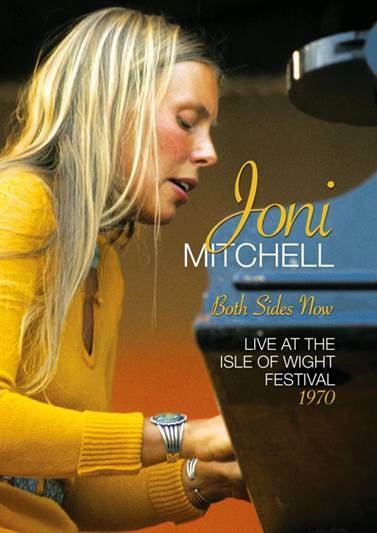 12 July 2018 (Toronto, ON) - On September 14, Eagle Vision/Universal Music Canada, the country’s leading music company, will release a brand-new Joni Mitchell film, Both Sides Now: Live At The Isle of Wight Festival 1970 on DVD and Blu-ray. Joni Mitchell is a unique creative force, a female troubadour who has lead the way for countless female artists with an enduring legacy of musical sophistication. She has been named “one of the greatest songwriters ever” by Rolling Stone magazine and is a 9-time Grammy Award winner. Watch the official trailer HERE. In 1970, the Isle of Wight Festival was one of the largest musical events of its time. Bigger than Woodstock and controversial from the get-go, hundreds of thousands of people descended on the island. Many of those without tickets set up camp on a hill overlooking the festival site, opposing the consumerism of the event and intent on ‘taking the music back’ by any means necessary. It was a celebration of hippie counter culture gone awry, and in Joni’s words, “they fed me to the beast”. Joni Mitchell took to the stage to deliver an outstanding performance against all odds. At times it was a battle against the audience as they tore down barriers and shouted obscenities. Her set was interrupted multiple times, including one man invading the stage to try to address the crowd. She later commented, “It seemed like an appropriate time to flee…”, but still, the seemingly fragile folk singer stood her ground. Instead, she returned to her piano, sitting on a fold-up wooden chair, and made an impassioned plea for respect from the audience. Continuing her set with “My Old Man”, she won over the crowd and the atmosphere softened. In response, the front page of Melody Maker hailed her with the frontpage headline, “Joni triumphs!”. Directed by Academy Award winning filmmaker Murray Lerner, who sadly passed away shortly after the film’s completion, Both Sides Now: Live At The Isle of Wight Festival 1970 features new interviews with Joni discussing her recollections of the event intercut with festival footage, both onstage and behind the scenes, which offers fascinating insight into a now legendary concert from the artist’s point of view. Fans can also enjoy the uninterrupted live concert footage which features some of Mitchell’s classic songs such as “Woodstock”, “Both Sides Now”, and “Big Yellow Taxi”.